Overdue update – 2018 York Rally! 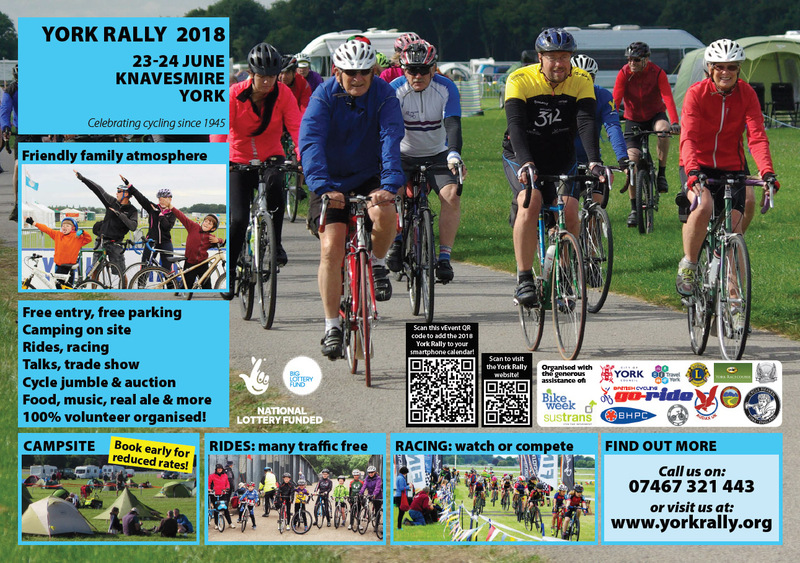 The next York Rally is coming up fast on the 23-24th June 2018 – and even sooner is our fundraising Sportive, on the 29th April! Non-racing activities for younger visitors have always been a tricky one at recent Rallies. We’re delighted that for 2018, there’ll be new children’s activities though the weekend from local environment charity, the Yorkshire Wildlife Trust, along with the team from iTravel York who work to encourage active travel in the city. We’ll have more details of both in the next newsletter. (2) Saddlebag Sale – your donations welcome! Need to de-clutter your cycling collection? Table bookings are open now for the Saddlebag Sale cycle jumble on Sunday – and this year we’ll also be setting aside a table for your donations, to be sold to raise funds for the Rally. Bikes, parts and accessories all welcome – you can leave them with us in HQ. Anything unsold will go to Bike in Need, a local organisation who provide bikes, panniers and locks to newly arrived refugees. We’ve also made a few small changes to the logistics of the sale – see the Saddlebag Sale page on the website for all the details. Many thanks to Shimano for providing several thousand metres of barrier tape for us to use at the Rally! This’ll be ideal for marking out the racing: once again the Rally’s hosting the British Schools Cycling Association’s National Grasstrack Championships, and a round of the Yorkshire Cyclo-Cross Summer Series. So plenty to watch and take part in! We’re delighted that Bishop John, the “Cycling Bishop” of Selby, has kindly agreed to join Rallygoers who attend the service on Sunday morning at St Matthews’, Naburn. There’s a traffic-free led ride over to the service from the Rally. See the website for full details! (5) Badge design – seeking an artist! Last call for the Sportive! We can always use more riders, and a few more volunteers would also be great! To sign up to ride, visit the Sportive page, and if you’re free on that Sunday to volunteer, at HQ in Haxby or out on the course, please call organiser Pete Dunn on 07740 171 252. All funds raised go to support the Rally! (7) Campsite – just a month left of earlybird rates! 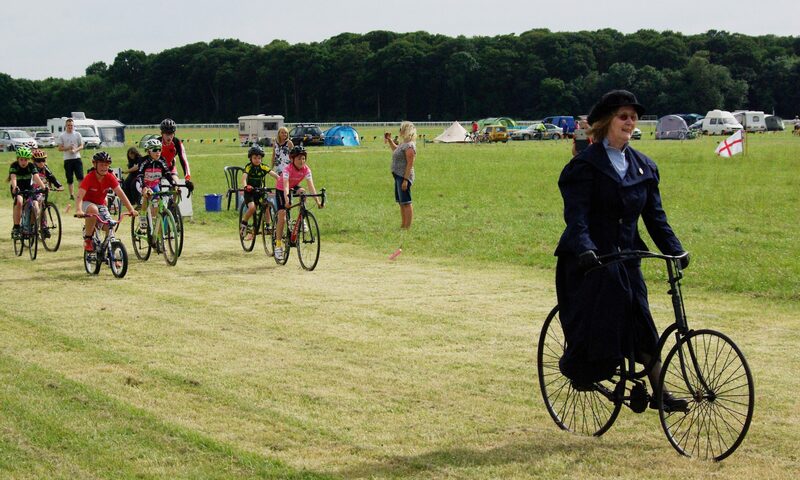 There’s just a month left for reduced-price earlybird campsite bookings: bookings are open now, online or by post. Please do book in early, as it really helps our finances and planning – and saves you money! (a) As ever, all are very welcome at our next planning meeting, which is on the 12th May 2018 at 10AM at the Church Hall of St Chad’s on the Knavesmire, Campleshon Road, York YO23 1EY. Please just let us know if you would like a lift from the railway station. After the meeting we’ll have a first aid refresher session, to remind us of the course many of us attended last year. All are welcome for this, too. (c) We’ve booked long-standing folk band The Foresters for Saturday night, as usual, but we’ll also have sessions during the day on Saturday from The Sonics, a ’50s rock and roll band comprising three keen cyclists. You can watch some sample songs on their Facebook page! Previous PostPrevious York Rally wins Big Lottery Fund grant! Next PostNext 2018 York Rally: new things coming!